Well I hope that the changes look somewhat better, I do struggle with this part of a blog. I really wanted to add my new page Food for Thought. I feel that it is really important to review ones shopping habits and eating habits regularly and I am particularly enjoying going back to basics and preparing good food from scratch. I am still making and using journals of all descriptions, sewing, knitting and crocheting. I have taken up needle felting again and also making pompoms for my granddaughter to play with. Ailsa is a great inspiration for making fairies and peg dolls. I really must post some photos, watch this space. Sprint is definitely here. Spent a lot of my spoons removing a mouse 🐭 from behind the fridge this morning. Back in my bed about to work only planner. It's that time of year when there are fixed deadlines to meet. December 1st,the beginning of advent. 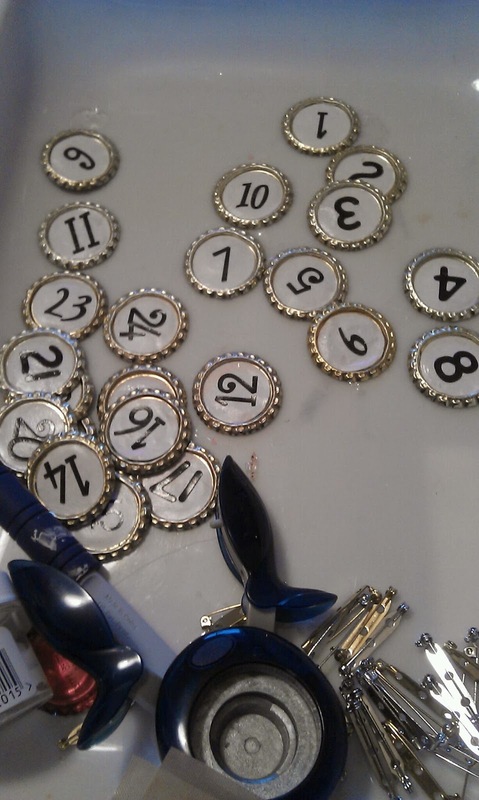 I decorated 24 jolly dolly pegs only to find that they are too heavy for my final project. So back to drawing board- 24 bottle caps waiting for resin to be poured and brooch backs to be glued on. I have also been busy making Christmas presents. Can't she you those until they have been given. Don't want to spoil the surprise! I really look forward to Donna's Inspiration Wednesday,there is something different every week. I can't wait to visit Michaels in Sault Sainte Marie this summer. Hope they have the Montana Paint Pens!!! 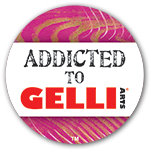 Very excited as yesterday I went on my first guerrilla art mission. I made paper eggs and abandoned them in a space near me. I was inspired to do this by Sherry. She used bleeding tissue method I used my gelli plate prints. It was a great feeling to think they will be found and treasured,or even tossed in the bin. At least someone else shared them briefly. 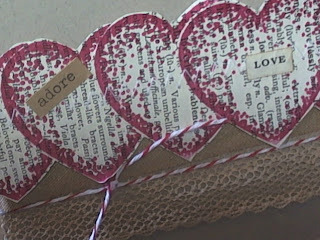 I used Creative Memories plain card as the base, I stamped red hearts in maroon archival ink on to dictionary pages. I chose the love section just because. 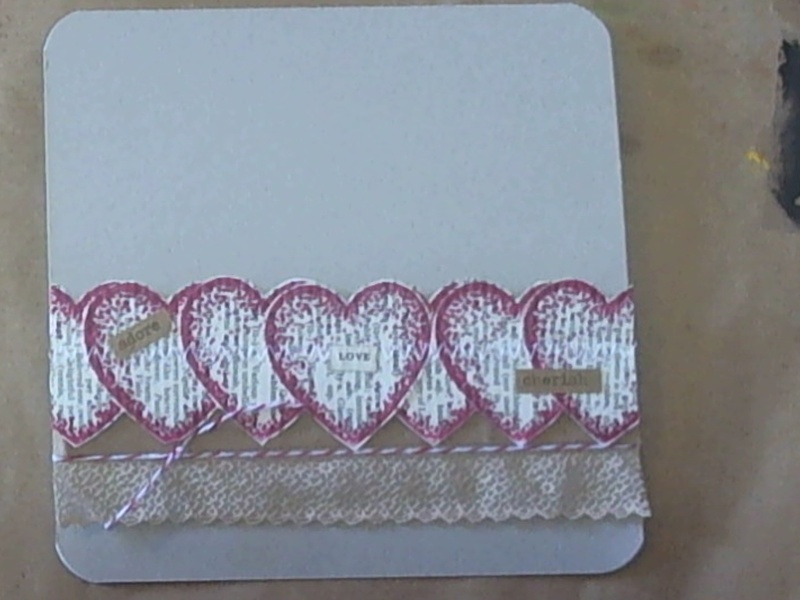 I used a zig zag stitch to attach them to a piece of hidden white card to make them seem as if they are just stitched and mounted them on to the card with foam. 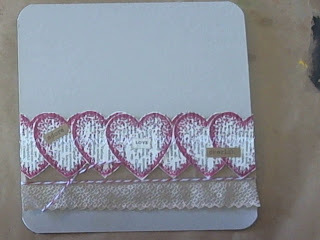 I also used a piece of bias tape, lace and butchers twine. 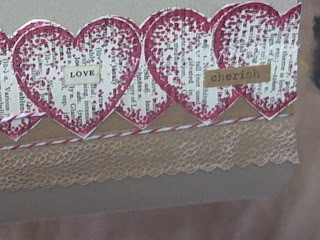 The words are from Tim Holtz Chitchat collection and the dictionary page. Why do I always leave it so long? Here I am again, why do I leave it so long between posts?? If I posted more often I would not have to rack my brain as to what I have been up to. I have come to the conclusion that it takes time to become ORGANISED and I am still getting to grips with it. I have to accept that the small steps and systems I implement now and more IMPORTANTLY stick to, will make it easier in future to be more organised. So I am going to add another page to my blog called Organisation, to enable me to share tips that I have learnt and am using. 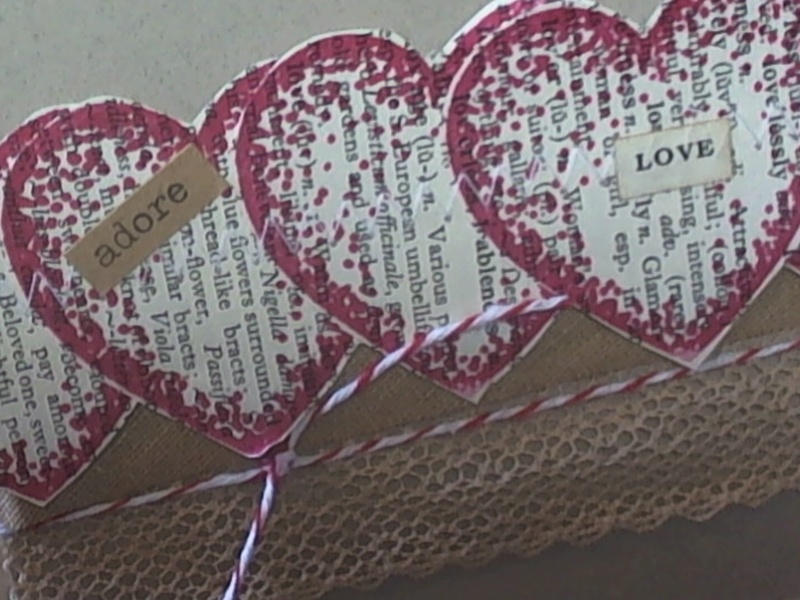 Of course Art and Craft are my main passion and I figure the more organised I am in other areas of my life the more time I have to enjoy my passion! The blogs I enjoy reading have lots of threads and links so I am aiming for that too. I would love it if you choose to follow along with me on my journey of discovery and that you will find something useful.